Doodlecast Pro is an app I included in my List of Digital Storytelling Tools. It’s a useful app, not just for children but for everyone. Basically you draw/write, and record your voice as you do (or not - you could just make an image with it if you wanted). Once you’ve finished, there are many sharing options, including YouTube, DropBox and Google Drive. You can draw, write or type text, and you can use photos or screenshots as a background. 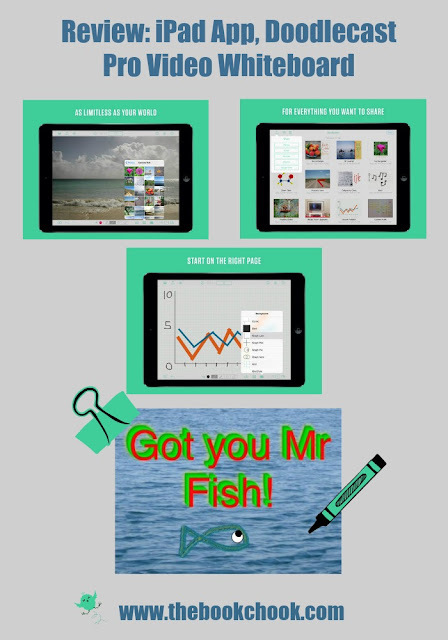 Doodlecast Pro is the easiest way to create presentations on your iPad. The app records your voice as you draw to create quick presentations. Doodlecast Pro saves videos to the camera roll making it easy to import them into popular video editors or presentation tools such as iMovie, Keynote, or iBooks Author. Perfect for teachers, students, business people and anyone needing an elegant way to share ideas. It’s great that Doodlecast Pro lets you save images/videos in standard formats because this makes it so much more flexible and accessible by others. It helps educators too that there is no sign up required. Presenting information in some way is a very common task students need to do, and Doodlecast Pro makes it easy. I also really like the option to import PDFs for a project - you can start something in Keynote or Pages, for instance, and open it in Doodlecast Pro. Kids will enjoy the many many tools, styles of font, stamps, fill tools, etc as well as the functionality of the app. It would make equally as great a choice for a youngster who wants to orally recount his fish story over an image he created (see within main image, above, where fish pic was created in-app), or for an older child who needs to explain a concept in Maths or Science. Check out my iPad App Reviews on Pinterest, and find more apps and articles via my Listly page.